Being the first model design of the SeaCraft family, this boat has become a collectors item sought after by many. Her deep steps and high freeboard makes her an ocean-going vessel that slices thru the more challenging ocean waves. 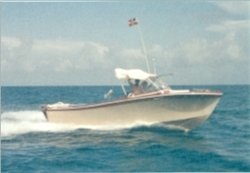 This Classic 21' has a history of ocean racing by Johnson-Kirby in the 1960's with twin 55HP Homelites. Since the 1970's, she's been enjoyed as a private boat and decorated for Christmas Boat Parades. 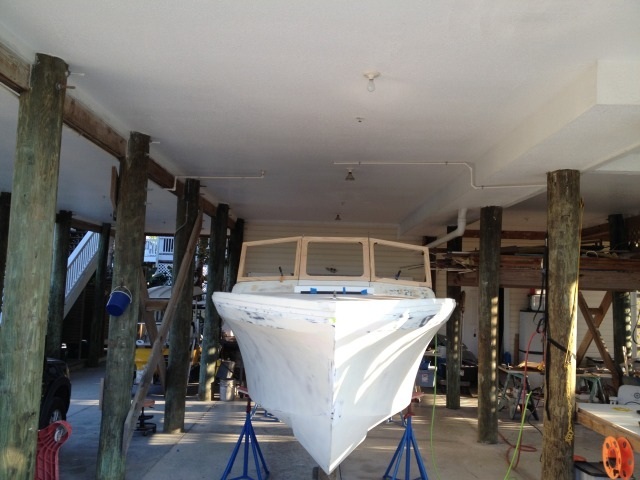 Early 2006, she was gutted to a bare hull by the previous owner in preparation of a restore. Now, in new ownership, the restoration continues. This boat was found in the frozen tundra of Green Bay WI. Home of my favorite team the "Packers". When the boat was found in 2008 I made the statement this boat will be restored by the time Green Bay wins the next Super Bowl (GB just cut Favre) I thought I was safe with that statement. Fast Forward the boat was sea trialed last spring but still is not done. It has been going through a complete rebuild (not a restore). 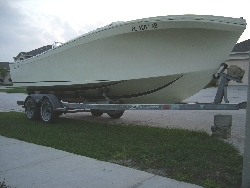 My new prediction is that it will be done by July 4th this year and the boat shall be known by the name of "FREEDOM"
Freedom will be plying the waters off the Gulf of Mexico near Boca Grande pass in SW FLA. 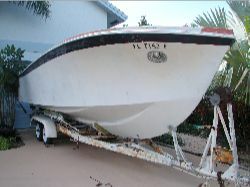 Originally ordered during the 1965 Miami Boat Show, Bob received a call from Carl Moesly stating he was too back-logged on orders (he had orders to build 10 govt. boats, armed with firepower) and would Bob be willing to accept the boat show model which had many more 'goodies'. Of course! For 27 years, this boat ran back & forth to the Bahamas, usually as the lead boat to knock down the waves for others to follow. Bob will still admit, it was a sad day when he sold her in 1992. Anyone know of her whereabouts? Previously known as the "Berry Picker", was found in Ft. Lauderdale, where the previous owner did not know what to do with her, thinking she was just "old". She had been purchased new and being good friends with Carl & Jeanne Moesly, had made several trips together to the Bahamas, each in their own 21'. On one such trip, hurrican Donna blew thru. They all survived well, but it was a memorable event! 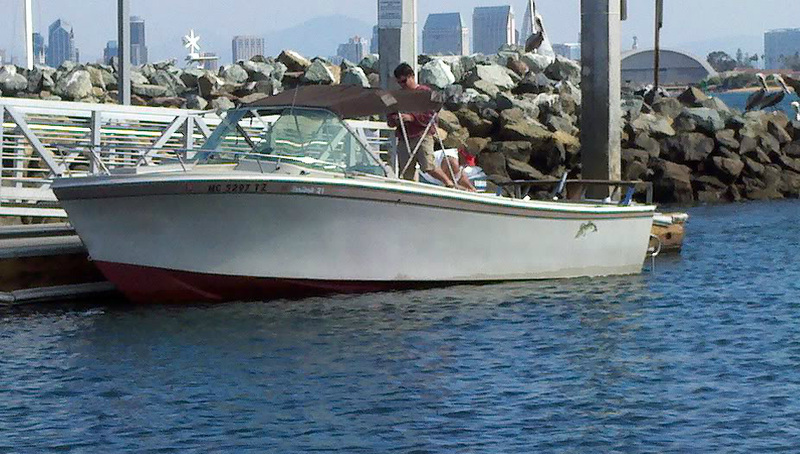 This boat was restored as a CC, enjoyed for over a year and then traded for a SeaCraft 27' SeaMaster. The new owner then sold her to one of Brian's friends, so she's back in his neighborhood and he still gets to go fishing on her. True to Agency form this 1966 SeaCraft 21 was detected using a combination of internet chatter and local intel. Long, monotonous nights of satellite surveillance confirmed suspicions of her presence on the hard in a field west of Lake Erie, between the Motor City and Cpl. Klinger's hometown. Subversive negotiations moved forward, and within weeks a U.S. Marine towed her west to the San Diego sunshine where she now resides. As I mentioned, she's a 1966 SeaCraft 21 Hull # 147 with the original Mercruiser 150. While she needs some tlc, she is very original and fully operational. Here she is at Shelter Island awaiting her next fishin' mission.